The sms from a friend who has migrated overseas asked us to check on the two articles which we posted on 24th September 2008 and 24th September 2009. Still after so much has been written it seems that the Sarawak State elections Saturday date is still far off. Correct me if I am wrong BUT its not so much the Pakatan parties of PKR,DAP and PAS but in Sarawak it seems that the EGOs of certain individual/individuals is a stumbling BLOCK says a Veteran Chinese politician to audie61 when we had lunch this afternnon. In the Chinese newspapers its all news about SUPP having a “dirty war””hidden hands” interfering in the Dudong branch controversy. DAP Sarawak are rubbing their hands as if the 4d Jackpot of 20 million is theirs. PAS Sarawak are claiming around 25 over seats too while DAP has claimed cheekily 27 seats and that leaves 19 seats for PKR. What about the local based opposition party SNAP..?? Hmmm this is interesting but we do not want to be attacked without any reason and its bests for the leaders to wake up and look closely at the lists below which we first posted November 30th 2008. Make up your minds or else no matter what you say BN WILL BE VICTORIOUS.. In 2006 Sarawak State Elections there was 54 Straight Fights,13 3-cornered,1 4-cornered,1 5-cornered and 2 YBS were returned unopposed. Just in case you forgot the mathematics we bring you back in time,”It was so near yet so far as in 1987 it was 48 constituencies the opposition wrestle 20 out of 28 and now there are 71 seats. A state women oppposition leader told audie61 a couple of months ago and it is still very fresh in my mind,” They will not be another better chance for us to realise this dream of wrestling the state from BN. 1987 was close but now we need to work even harder” Could the States oppositions HALLUCINATION turn to Reality……. All is not lost…. Its like saying Malaysia has 6 seasons Anwar,”Hot,Hotter,Hottest and Wet ,Wetter,Wettest” When this Malaysiakini report http://www.malaysiakini.com/news/90327 headlined Anwar changes tune,deadline not an issue a political analyst said its a way of saying,” Hold on.! I am consolidating my forces for the final push.” The decisive battle is nearer as the so called informants have been identified and the minute details are to be ironed out before the takeover. A matter of time sounds better don’t you think instead of issuing deadlines. This very important political message by Anwar,” The deadline was Sept 16 – Sept 16 was the date we were ready and we have made it very clear (but) who could anticipate that the prime minister would refuse to discuss (matters) of national importance – who could anticipate (that the) prime minister would refuse calling an emergency (parliament) session when we claim we have the majority,” is like overturning a defeat to sustain another round of attack. His wise counsellors have already preempted that the PM and the UMNO boys have said all along that,” In the long run we shall overcome.” Anwar knows for well that Malaysia has 6 seasons and he will strike at the wettest season when UMNO thinks they are comfortably home. When the PRS crisis was at its highest peak the then former YB of Simanggang Jimmy Donald was told by the then Deputy Minister in PMs office YB Joseph Entulu that ,” We shall overcome and you all will be WIPED OUT and FINISHED in the long run.” This is politics…It’s getting there as the forces with YB Larry Sng are exhausted,morale has sunk,programmes have been done without much headway, too much distress and insecurities promised and some of the generals are seen to be holding a WHITE FLAG. We have to face REALITY as the State and the Federal governments have acknowledged James Masing as the President of Party Rakyat Sarawak. Logically speaking,do we fight if the faction is not powerful enough,including disillusioned supporters with no strategies and no consistency..? The worn out generals sees a stronger PRS would mean that the party will not have a”DURI DALAM DAGING” meaning “THORNS IN THE FLESH“. We cannot be like the ‘lallang” grass anymore. PRS needs to consolidate and be a force to be reckoned with instead of too much infighting. Anwar knows that very well too. He has utilised all methods and political strategies to ”ROCK the BN Administration.” But Pak Lah has not wavered and keeps coming back to fight. He is not seating still as many has thought that it will be a little too late for him. He was afterall,”ALWAYS SLEEPING”. PM is not just going to be pushed right down to the bottom of the sea and also not going to surrender UMNO’s position to PKR. Now he shows his resolute self eventhough he is being cornered by not only Anwar but Mahathir,Najib,Muhyddin and Tengku. I would not even give him a ghost of a chance to come out of this battle alive. But he has studied all the moves made by Anwar and Najib that he survived this onslaught. Anwar knows his credibility is tarnished and he has met up with his generals in DAP,PAS and PKR. They have said their points in the closed door meeting and Anwar has come out of it wiser. He needs to consolidate his forces and he needs the generals to fight alongside him and be more active yet careful with their attacks on BN leaders. The political situation is so fluid at the moment and any wrong moves by Pakatan will be tracked and quashed. Anwar needs now to calculate meticulously his next move. There must be a comprehensive and detailed analysis of the mood in the country. Now the 916 has been called a big “LETDOWN” by most Malaysians. Anwars next political move needs to be one of dominance and he needs to attack the very core of BN alliances and disrupt their strategies until the WHITE FLAG is raised. Latest :-The Election Commission (EC) has fixed Aug 25 for the Permatang Pasir state seat by-election in Penang. Nominations will be on Aug 17. May 1st 2008 we started blogging and how time flies. We have written todate 768 articles with 16217 valuable comments from you good people out there. During this period we have witnessed a lot of happenings amongst which was the supposedly 916 change of Government, SAPP leaving the BN coalition,Abdullah stepping down as PM,Najib helms the government as PM,BN losts 6 by elections winning 1,People’s call for abolishment of ISA, “Cawat and Dayak” interpretations,Political parties infighting,Economy on a downturn, BN wrestling back Perak and the constitution being bent to one’s whims and fancies, BN and Pakatan still at each others throats,death of Teoh Beng Hock and nearly the death of Uninterrupted internet Accessibilty. It’s been a great 16 Months of blogging with a lot of hiccups no doubt. audie 61 and the crew of Natasha,Joey,Bugi and Cindy plus the technical maestro Anthony would like to thank all visitors,supporters and alliances for a great journey so far.We will be reaching our first milestone of 1/2 a million soon and without you good people out there it will be virtually impossible. Malaysia Needs Good People and Lets keep Abreast with all the developments and policies which will affect the country. Keep on checking the Ruling State governments in your respective States be it Pakatan or BN . If they perform well keep them but if they deny you your rights Replace them. Continue to check,praise or harrass your ADUNS and MPs as they are there BECAUSE OF YOU. NOTHING ELSE MATTERS. MALAYSIA IS YOUR LAND WHERE YOU ARE BORN. KEEP THIS DREAM SAFE AND INTACT FROM ALL ADVERSARIES.. 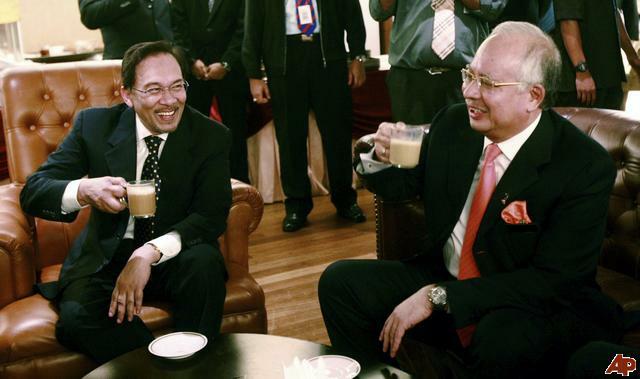 Cheers to all of you and continue to be with audie61…..
UMNO President No doubts..PM When..?? PM Abdullah told the reporters after his Presidential meeting with the delegates that Najib Abdul Razak will be the the new Umno president. We say as always,” Has PM Abdullah officially announced..? I am indeed puzzled and please enlighten me if there is an official notice hidden somewhere from the publics eyes. If the reports are accompanied by facts,figures and statistics and plus backup pictures( authentic ones) the report will be picked up by the mass media and even International TV stations (Al Jazeera has proven it). On the home front today we have Borneo Warrior continuing with this reporting of Battle Royale No.8 and in Malaysiakini Joe Fernadez writes about “Sarawak for Sarawakians concept and interview with PRS President James Masing. Surely,this will also be politicised by the PKR political boys. We shall see what HAPPENS in the days to come..Is PKR going to take it lying down..??? In the Broken shield it was Jabu,Entulu,Masir and Snowdon who were all mentioned that they gave lectures similar to this one posted by the writer here,”they “are part of the government and therefore have an important role to play”. They must show good example by not inciting their own people to go against BN and must tell their “anembiaks” to vote for BN. One former PBDS SC member said,”Yahoo,Jawah its an all out battle between former PBDS leaders from different camps. Bad blood was spilled between them during PBDS crisis and leading it to be defunct.We have not forgotten.Who stands the better chance between the candidates was the follow up question by Natasha of audie61? Did we expect a straight answer…hmmm? His guns were really blazing and he wanted to carry on with stories and tales of PBDS. Natasha was accomodative but said we will carry the story on another day.He concluded with this phrase “ANANG BULA,CUKUP UDAH,TUNAI KE JANJI”” (Dont lie its enough,deliver what you promise.’) Are you all learning the Iban language..? Great, but dont use it wrongly or we can’t bail you out…..
We say as always,” Watch what you have to say from now till April 7th. Your choice of words and the correct way of using them are very important as any WRONG USAGE might just LAND YOU INTO A SPOT OF BOTHER. It seems every Monday in Malaysia there will be news that really jolts the nation and makes our pulses beat faster. Could Panadol be the answer? Baginda Minda (former PRS information Chief of Baleh) contacted audie61 and said,”We are all behind Jawah Gerang as PKR candidate for N29 Batang Ai after the DSAI announcement this morning. Baginda said that PKR does not have as much funds like BN who have a huge war chest.We certainly cannot use the methods practised by BN like rebates on outboard engines,projects “kilat” and also ‘angpaus’ like my friend Joseph Tawie of Brokenshield said in his posting. We have more headaches and we need to take a Panadol or two and fight the might of BN to win the seat of N29 batang Ai. But Monday Malaysia has thrown up some controversies yet again. So Boomtown Rats song in July 1979,” I Don’t Like Mondays” will be a day remembered by Umno supreme council member Norza Zakaria who has been barred from contesting in the UMNO party polls. If you are a PAS and Keadilan member you would ‘swear and shout,” I Don’t Like Mondays’ more as the Home Ministry has suspended the organs of two opposition parties – PAS’ Harakah and PKR’s Suara Keadilan-for three months,effective immediatedly. We say as always,” So how was your day my friends in Malaysia? Did you sing to the tune“I Don’t Like Mondays”? Or did someone ask for a PANADOL from you? It was just a beautiful feeling to have met such an intellectual and open minded group of bloggers in Zorro,Delcapo and Harris Ibrahim together with SKY former MP Bandar Kuching 1982-1996. Also present were Malaysiakini journalists in Tony Thien and Joseph Tawie. Kaypo-Kaypo Food Politics feature writer Cilla Balla was also present. I would also reserve a special mention to Wong Chin Huat a columnist from Nut graph in which both us engaged in local Sarawak Politics. He has been here 3 times and I did mention to him the ‘Ground Zero” battle is so much different from the cyberspace or blogsphere. It was an interesting BRAIN DAMAGE WORK for me as I did not expect to be enlightened and the arguments were fruitful and with no malice or harm meant. Its only OPINIONS and it will benefit Bloggers more if they are UNDERSTOOD and not FEARED. Who says Bloggers from both political divide cannot meet? We are after all Malaysians and if there are too much hate sowed it is not at all healthy for the future. We are setting an example for FUTURE MALAYSIANS. This generation needs to open up and only if we are willing to step three steps forward in our THINKING can we fully developed this Nation. Of course the Barisan Rakyat Bloggers are here to have the TRUE feel of the Batang Ai N29 by elections. There will be making their presence felt as they will be led by PKR Stampin Division Chairman See Chee How and Information chief William Lee. The question is still,”WHO WILL WIN N29? How far will the BR bloggers influence the PEOPLE to ensure that their work are not wasted as the VOTERS will vote for the right candidate. It’s the PEOPLE’s CHOICE and the party machineries needs to work hard to woo the voters. All other reasons will be irrelevant and considered useless after April 7th. We say as always,” Thanks for the moments and its well worth an afternoon’s work.